When in Mikkeli I met a local artist, a weaver, Julio Tubal. He took interest my works and my fascination of themes from Nature as the “Cachiru” - and of the Kalevala´s legend. He got the idea to work on my themes on tapestry and to make an exhibition the following year with paintings and textiles together, side by side. I returned to Finland (a really long trip from South America) last July to be present at the opening and at the same time to show some of my paintings on a solo exhibition. A great day, counting with the presence of actual Ambassador of Argentina, and a couple of Finnish musicians, playing Argentine tangos. South America is a mix of reality and dreams, a place where the two dimensions, Space and Time could weave together into magic scenery. My art´s education, proper of a rationalistic, European origin, did drive me to modern parameters and guides. But on the other side I was living in a corner of this planet, where the strong influence of old cultures, like Mayas, Incas and others came to my image creations. Are we, actual artists, tied to our materialistic, surrounding life....? Giving only importance to objects and a cold reality? Was born in 1947 in Argentina and began painting at the age of 17. Returns to South America after living for couple of years in Canada. During 1975, he fixed address at La Rioja, an Argentine province, a desert, a lonely and hot place, close to The Andean Mountains. Still living there. He attended “The Fine Arts School” and began showing his paintings from 1978 and on. From 1981 he worked at the local “Department of Culture”, as “Chief of Visual Arts Department”. He began showing his art in Europe in 1992. He returned once a year, having shows in France, Italy, Spain, Denmark, Finland and Egypt. In America he had exhibitions in USA, (New York), in Mexico, Costa Rica and Chile. Lately he got the MFA degree at the Buenos Aires University. Huelva –Spain, School of Hipoacusic children. School of Greve city, Denmark. Alexandria –Egypt, street wall painting. Artist in residency: Gallery Ari, Mikkeli, Finland, 2011, exhibition and workshops for children. Wall painting at the streets of Al Manshiya´s. Director for the Arts Schools, 1981 - 86. Jeg arbejder i mange forskellige materialer. Det er vigtigt for mig at finde frem til lige det materiale og lige den form, der bedst kan udtrykke det, jeg gerne vil fortælle. 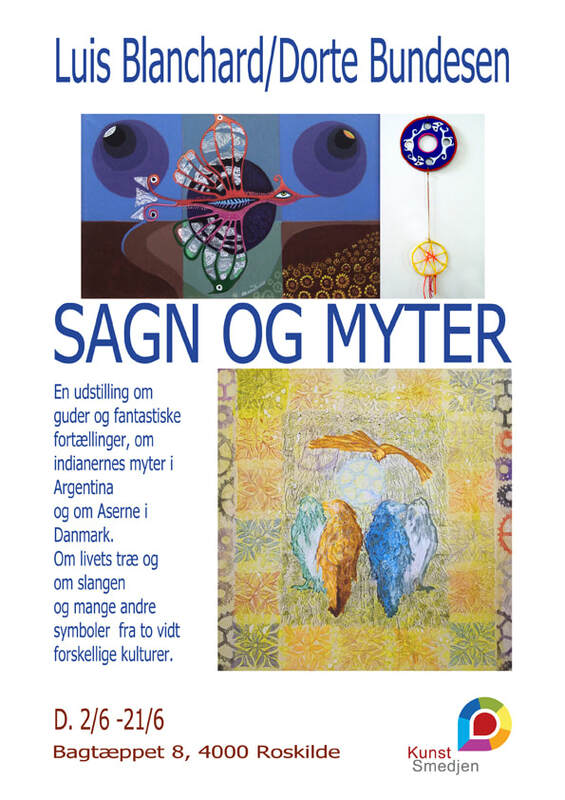 Det er også vigtigt for mig som kunstner stadigt at udforske mulighederne i forskellige udtryksformer så jeg er også simpelthen nysgerrig og vil gerne eksperimentere med nye områder indenfor billedkunsten! Ofte er mine billeder i to fysisk adskilte lag. Motivet kaster skygge på baggrunden så udtrykket ændrer sig alt efter hvor beskueren står. Ligesom vores opfattelse af verden ændres – alt efter hvilken synsvinkel vi har. Rezepte aus – Bienale Venedig 2017. Hyldest til Anna Ancher, KKS 100 års jubilæum.